As wickedness increases on the earth, so does the power of satan. He can work signs and wonders, transform himself into an angel of light, and has abilities to entice, mislead, deceive, trick, and tempt that are great, even to the extent that the very elect will succumb. His deceptions can be so subtle and can seem so real, like mirages of desert oases that we yearn to reach, but that ultimately result in one distancing him or herself so far from God that they are off the path to eternal life, wandering in strange roads. The ground cover in our fruit tree orchard is a mix of orchard grass, wildflowers, and weeds. Until one develops an eye for it, it is very difficult to tell the weeds and the wildflowers apart until they bear fruit (form a head). In times past, I have inadvertently ripped out many good wildflowers because I thought they were weeds. I was working in the orchard the other day, trying to clear out weeds, and came across a tangle of large wild clover and alfalfa. I almost bypassed the clover because it was so well camouflaged in the alfalfa (our animals can be fed the alfalfa). 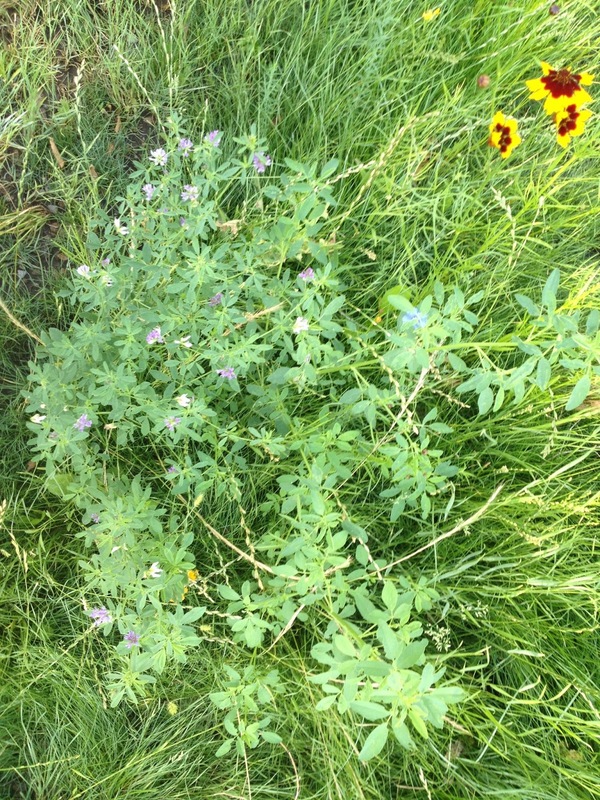 It was only for the newly developed fruit (the purple flowers) in the alfalfa that I spared the good and was able to trace the clover to its root and pull it out. The wild clover has a very long and skinny root that grows rapidly, which it can be difficult to pull out if the soil is dry and hard (so does alfalfa by the way). A few lessons to draw from this: 1) for the unexperienced, it takes time before the fruits will appear that will help us to know truth from satan's counterfeits. It is important to be patient, not act hastily, and seek out guidance from the spirit, which will teach us the truth of all things, before acting. 2) It is important to keep our own spiritual ground fertile with soft soil. If we allow the soil of our hearts to become hardened, the advancements made by the adversary will be more difficult to root out when they are identified. 3) No one is immune, regardless of status or background, from the enticements and deceptions of the adversary. These weeds spread and pop up everywhere. They learn how to transport themselves even into the most well-tended gardens. Anyone who thinks they are beyond satan's reach, no matter what they do or how they live, has been deceived. 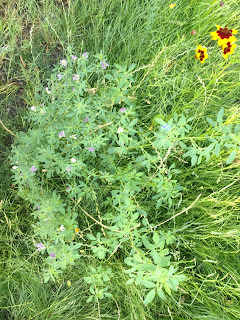 Alfalfa with flowers (left) and wild clover (right). Be warned that we are in the last days. There are many people who seem very good and kind, but who are ravening wolves underneath. They have been deceived into thinking they are doing the will of the Lord, but they are following a counterfeit lord and master who wishes to enslave them and receive their worship. These people have seceded part or all of their salvation to others, so called spiritual guides, fallen angels, false prophets, deceived and narcissistic gurus, immoral teachers, and whoremongers. There are many in our day who profess to communicate with deceased prophets and angles, who feel they posses gifts of the spirit that allow them to receive personal revelation and insights for others, who claim to "see" into the spirit realm, who perform healing through energy work, magic oils, crystals, enchantments, and divination, and who entangle themselves in the spirituality of others and play god with the souls of men. They crave the power and fame they amass as they perfect their craft and gain notoriety, writing books, offering seminars, and selling their services for profit. Although many of these are nice people, these diviners, soothsayers, witches, and communicators with familiar spirits are the same which the Lord denied and will deny again and say "Depart, I never knew thee". In the scriptures, there are no examples of such as called of the Lord. Some of the deceived will tell you that their teachings and methods are beyond the scriptures, held in secret and in reserve for those who are truly righteous, that the scriptures are dead. These must repent of their pride and treachery and the damage they have done to so many in our day. They are those who have not learned to wait upon the Lord and practice the simple virtues of purity, obedience, faith, love, and charity. They are seeking out an alternative route to salvation, which seems like the right path, but there is a dead end ahead. It is true that some may have had genuine experiences with gifts of the spirit at one time or another, but then they became a god unto themselves, the spirit became grieved, and they were left to their own devices, or those which satan, the god of this world, gladly provided. Many of these individuals believe that any spiritual manifestation they receive is of God. Almost every word of the temple endowment will help us understand the threat of deception by satan and his counterfeits, and thus endow us with increased powers to avoid them. Listen carefully to the words of the adversary: "what do you want? ", "you can have anything in this world", "you will be like gods", "I will teach you the philosophies/commandments of men mixed with scripture", "these teachings are received quite well". Listen to the words or reactions of Adam: "I am looking for messengers from the Father to teach me", "this man does not believe what is being taught". In other words, when one embarks on the path back to the Father, the adversary will come to tempt and deceive them into worshiping him. When we call out to our Father in Heaven, the god of this world may be among the first to answer, seeking our attention and offering us the desires of our hearts, pushing us towards destruction. It is important that our hearts remain focused, that we do not believe in the teachings of this world or settle for the rewards and things of this world. We must keep the commandments we have been given and then the Lord will send true His messengers to teach us.